Rise of the Undead McLeach. 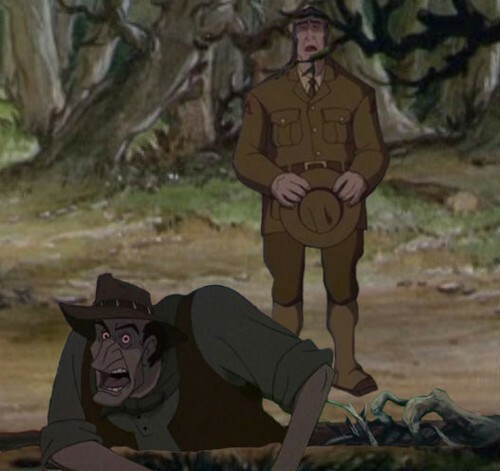 Rourke officiates at McLeach's funeral while McLeach rises from his grave.. Wallpaper and background images in the डिज़्नी क्रॉसोवर club tagged: crossover disney rescuers down under atlantis. This डिज़्नी क्रॉसोवर photo might contain ग्रीन टोपी, विशेष बलों, कुलीन सैनिक, हरे भरे, विशेष बल, हरी टोपी, अभिजात वर्ग सैनिक, राइफल करनेवाला, राइफलमेन, and रायफलमैन.